Find out what people are doing on BookGlutton! If you’re not familiar with Twitter, it’s a free service that sends short, immediate messages to a webpage, so you can stay in touch. Think of it as a mini-blog. 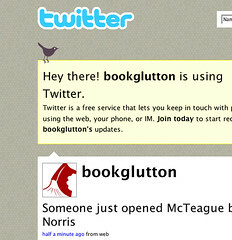 Every time someone opens a book on BookGlutton.com, our robots automatically update BookGlutton’s Twitter page: http://www.twitter.com/bookglutton. If you’re not logged in to BookGlutton when you read, or if you’ve chosen to read in private (under Manage Your Account > Personal Information), the Twitter stream will just say “Someone” is reading. Otherwise, keep an eye out for your friends nickames. Those will appear here, and you can jump back onto BookGlutton and join them. It’s pretty addictive!